The Barix Annuncicom device enables integration of Rava-enabled Crestron touch screens with analog intercom systems. This simplifies Voice over IP (VoIP) integration between intercom and control systems in residential and commercial installations. Crestron Rava touch screens leverage SIP (Session Initiation Protocol) to permit voice intercom, telephone and paging among other applications across the home, office or small business. The inclusion of Barix devices with Rava SIP firmware uniquely establishes compatibility between Rava-enabled touch screens and analog intercom systems and door stations. This allows customers to continue to use their existing analog systems when upgrading to or installing Rava touch screens, providing seamless integration of the analog world in the new, digital control system. Due to peer-to-peer capabilities of both Crestron panels and Barix devices, no VoIP/SIP Server is needed. 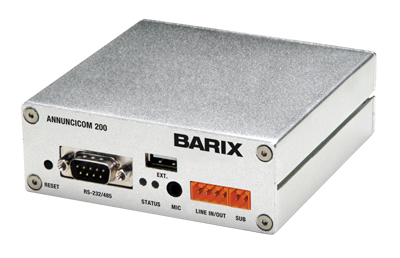 The Barix solution can be deployed today by connecting Barix Annuncicom devices, which essentially are IP two-way audio hardware interfaces, directly to door stations or intercom systems. Crestron is also working with companies such as eHolovision, which manufactures a series of intercom entry panels for door stations. Barix adds the same functionality to these and other third-party panels equipped with Barix IPAM Series modules. This enables peer-to-peer SIP and Rava compatibility without additional hardware. Intercom devices and door stations can be addressed via SIP extension. Gate control, intercom and paging, based on VoIP standards, for residential, school, hospital and office installations.